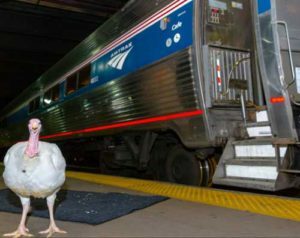 WASHINGTON – The Thanksgiving travel season will soon be under way and Amtrak and the Virginia Department of Rail and Public Transportation (DRPT) are prepared to accommodate additional customers traveling on the Northeast Regional during the busiest travel week of the year. The Northeast Regional provides a same-seat trip from Norfolk, Newport News, Petersburg, Richmond, Washington, D.C., Baltimore, Philadelphia and cities as far north as Boston. Book Early: Customers may purchase tickets on Amtrak.com, Amtrak mobile apps, or by calling 800-USA-RAIL. Regular Amtrak booking and ticketing procedures apply. 2+2 = Free: Customers may bring two bags and two carry-ons, collectively weighing up to 150 pounds. Arrive Early: Allow plenty of time at stations prior to departure. Arrange for pre-boarding if you need extra time or assistance. Check Train Schedules: Make sure to check holiday train schedules prior to arriving at the station with a helpful, online-only timetable provided by Amtrak. Carry Photo ID: Make sure to carry valid photo ID at all times, as it may be requested aboard trains. Be Safe: Be aware of your surroundings, stand back from the edge of the platform, do not leave your bags unattended and watch your step when boarding or leaving the train or when walking between cars when the train is in motion. If you see something, say something: Report any suspicious activity or unattended items to an Amtrak employee or member of the Amtrak Police Department at (800) 331-0008, by calling 911, or by sending a text to APD11 from a smartphone, or to 27311 from a standard cell phone. 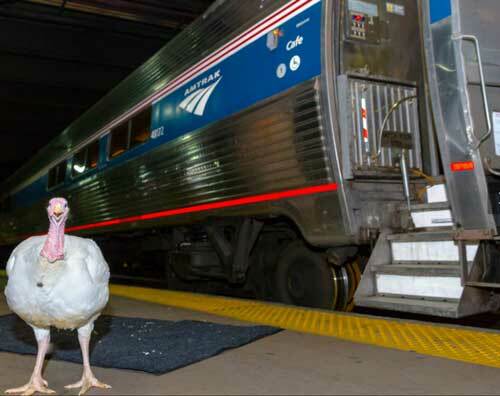 All Aboard Pets: Amtrak welcomes cats and dogs weighing 20 pounds or less for only $25. Make sure to bring the appropriate carrier. Some restrictions apply. Bring your Bike: When you travel, reserve a space for your bike on select Amtrak routes. Some restrictions apply.